Yes, I want fries with that. But not those fries. I want the fries of yesteryear. I wish they'd have two types of fries on the menu at McDonald's. The first could be whatever the hell they want or need to make to appease the whining masses who complain about the health values of the fries, as though fast food french fries will ever be anything but bad for you. And the second--my fries--would go back to the old recipe, before they started using vegetable oil and started worrying about health reports over flavor. 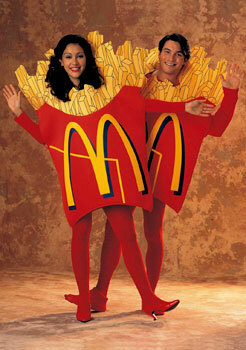 Ah, for the McDonald's fries of my youth. Today's version are just a poor imitation. You know, some people say that the reason Americans eat so much junk is that our food tends to be so bland. You eat more, hoping with each bite to get more of that full flavor that whatever you're chewing on just hints at. Who knows? The fries of my youth might actually prove to be healthier because you'd eat fewer of them, sated earlier with all the goodness that McDonald's fries used to be. The fact that I've fantasized about having a time machine to go back in time and eat real McDonald's fries is a little sad.